Staff Kilmoon Service Station where the ticket was sold. THE NATIONAL LOTTERY is making a final appeal for a €500,000 winning Euromillions Plus ticket that has gone unclaimed since September. The original deadline to collect the winnings was extended because of the Christmas period but now the final deadline 28 December. 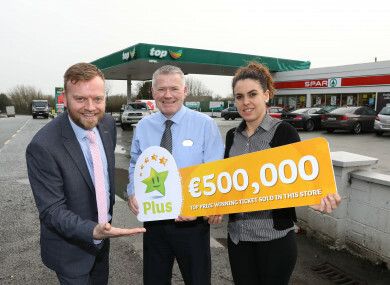 The winning ticket was sold in the Kilmoon Service Station in Ashbourne, Co Meath ahead of the draw on Tuesday, 26 September. Usually, winning ticket-holders have 90 days to claim their prize but the National Lottery extended that period after the prize went unclaimed. “Time is running out. We are urging everybody to check their tickets so they don’t lose out on a possible incredible win,” a spokesperson said. The winning numbers for the prize in question are: 17, 31, 37, 40, 46. Email “'Time is running out': A Euromillions Plus winner has until Thursday to claim €500k”. Feedback on “'Time is running out': A Euromillions Plus winner has until Thursday to claim €500k”.